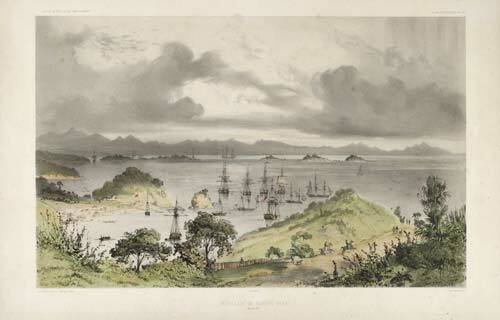 This lithograph, dated 1840, shows a large number of vessels moored off Kororāreka (now known as Russell). In the 1830s the town was a trading centre for whalers, seafarers and merchants, but it also attracted deserters, escaped convicts and other lawless individuals. Several attempts to impose law and order culminated in the Treaty of Waitangi in 1840.